El Espacio Elevado, participative-interactive installation, 2018. Two audio clips in spanish with the guide of Ana Corti on the execution of the Excercise 1 (inverted posture) and Excercise 2 (sound sense). The Elevated Space endeavours the recognition of real space-time and transforms the showroom into a playground for experimentation, a place of interaction to transcend the physical-temporal beliefs. 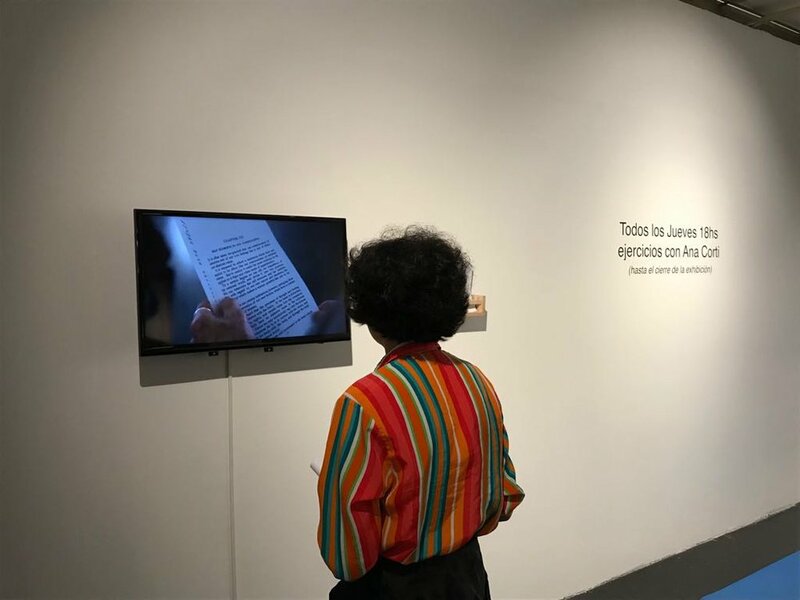 The installation proposes an intervention in the exhibition space in which the viewer - through their voluntary participation - becomes part of the work. The final goal is not social interaction as Bourriaud proclaimed, but self-interaction. From a relational aesthetic to an individual aesthetic, where the stimulation of the senses and the recognition of real and physical forces are the final objectives. The virtualization of information -and of our lives- concluded in affecting deeply our interaction with the environment and the space that surround us. In contrast to the real and physical space, we are facing a virtual space or cyberspace based on a network of forces and interactions that act on us, dominating us. The isolation we suffer as a result of the hyper-connection, reproduction and the multiplication of rumours, posts, likes, stories, the oppression and mental exhaustion –consequence from cognitive overload– or the addiction generated by the visual stimulation of our screens, culminate in an unconscious-numbed state of our lives; we lose the notion of space-time and individual autonomy in favor of greater control of our environment. The installation works with the recognition of the fundamental forces of nature -considered since the nineteenth century and maintained by current physics- in opposition to the new inherent forces of cyberspace. These forces, sustained by the collective unconscious, hold us together, defining our existence and our behaviours. The exercises, which last from 10 to 12 minutes, propose a sequence of postures and movements that, together with an introspective inspection of the spectator, will unleash in each unit the awareness of their body, the space that surrounds them and their interaction with it. The objective is to reconnect the viewer with the "forgotten" space and expand the accelerated time, reconnecting it with the concept of real spacetime. The exercises will be guided by Ana Corti (specialised in body kinetic mystery) every Thursday at 6 p.m. until the end of the exhibition. Training in movement: Bayerthal Method in Conscious Gymnastics and in more body disciplines – with national and foreign masters– where body and mind go together. Music training: singing, oboe with Uruguayan and American teachers. I sing with Master Marta Sánchez. Professionally: Oboísta in symphonic band of Maracaibo and oboe teacher in Youth Symphony of Venezuela. Teacher of flute in Crandon School of Music and Center for the Arts, and in Pemu (First School of Music Therapy in Sweet Flute and Movement). Body Teacher in theatre schools of Montevideo and the interior, being founder of the Alambique Theater Action School 15 years ago. Currently: she is studying Eum in body awareness since 88. He has participated in multidisciplinary projects for the viability of the Faculty of Arts. She dictates workshops and seminars for students and professionals of theatre and music and for health professionals, making a personal and integrating synthesis of the disciplines described.